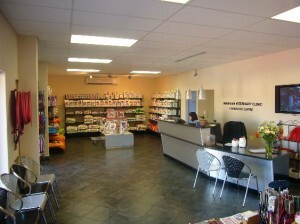 Panorama Veterinary Clinic & Specialist Centre is dedicated to offering first opinion veterinary medicine of the highest caliber and has been servicing the local community of Cape Town for 16 years. We also have a South African Veterinary Council registered specialist surgeon that offers a referral service for cases that require specialist facilities and expertise. We are open 24 hours a day, 365 days a year with a 24 hour emergency service that offers after hours cover for local veterinary clinics and their four legged clients. Our team includes 6 Veterinarians, 1 Specialist Veterinarian, 2 After-Hours Veterinarians, 5 university qualified Veterinary Nursing Sisters and 4 Technicians, all supported by a very competent administrative and support staff. Our clinic is currently the only facility to offer specialist surgical services in the Cape Province which includes an Animal Eye Hospital. We have a separate Cat Clinic with its own entrance to minimize the trauma to your feline pets and a sound proof dog ward. Panorama Veterinary Clinic and Specialist Centre comprises a general practice to service the local community and a Specialist Centre for referring vets.